That’s the promise from Wintriss Controls Group with its ShopFloorConnect overall-equipment-effectiveness (OEE) and shop-floor data-collection software. It can gather production data from every machine in a factory, display the key performance indicators (KPIs) in real time, and produce detailed analytics, including comprehensive OEE reports in a variety of formats. The software’s OEE calculations accurately report equipment effectiveness for even the most complex manufacturing environments, and can increase manufacturing capacity and profitability by identifying and quantifying excessive production losses and bottlenecks, according to Wintriss officials. The scalable and flexible production-monitoring system is compatible will all ERP software, making it well-suited for various applications and industries. And, the production-tracking software provides machine-downtime and manufacturing-efficiency reports via a web browser and email, and integrates with existing systems. 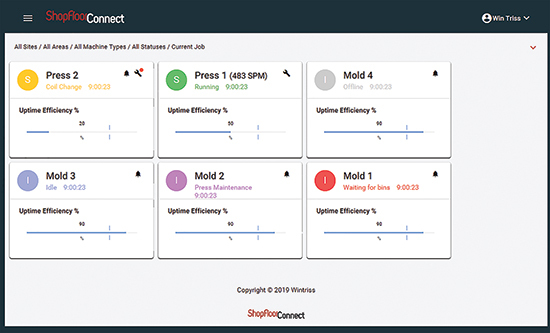 “Automatically collecting important efficiency and downtime machine data results in on-time, accurate reporting while removing subjectivity,” says Keith Magnant, ShopFloorConnect sales manager, noting that the software provides an easy-to-use, efficient data-collection solution that can reduce machine downtime by as much as 70 percent.